On paper, I shouldn't get on with Guy Fieri. He is exactly the sort of brash, loud, over-bearing American caricature that I just simply cannot abide. What with my stiff British upper lip and all that. Guy's penchant for bleaching facial hair, wearing sunglasses on the back of his head and a sweatband to cover up a nobbly elbow should get me all edgy and irritable. Throw into the mix a vocabulary that knows no boundary when it comes to the inane, the bizarre and the inconsequential; well I should grimace, spit and shout every time his gurning face appears on my screen. Whenever Diners, Drive-ins and Dives comes on, I should scream at the tellybox - "WHAT THE HELL AM I DOING WATCHING THIS TERRIBLE, TERRIBLE MAN? DARLING, FETCH ME THE MELON BALLER SO THAT I MAY PLUCK OUT MY EYES!" Because I love Guy Fieri. I don't know why but his cartoon enthusiasm and random batshit is very infectious. Like a big puppy Labrador, he bounds all over the place, hugging, fist-bumping and slapping line chefs aplenty and he is over-brimming with positivity. Even when a plate of greased smoked hog's arse, drizzled with molten cheese, grits and pickled jalapeños is shoved under his nose, he is always more than happy to shovel a spoonful in his cakehole. It all amounts to a very strange yet totally compelling viewing experience. So yes, I am a fan of Guy Fieri and I am a fan of Triple D.
As I have already mentioned, the best part about Guy is his notable use of the random word or catchphrase here and there. Time after time he reels them off and in the past I have looked at my wife next to me and said "Did he really just say 'you must have a PhD in Deliciousness'? Did he??" Which is all part of the game when watching. 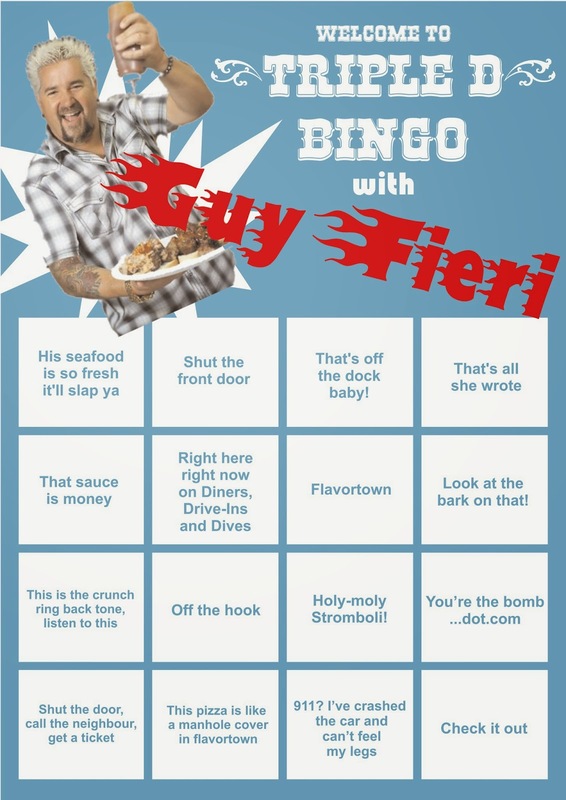 So for a laugh, I have whipped up a bingo card for people to use whenever they watch Guy Fiery. I shall be watching Diners, Drive-ins and Dives in my Beamly TV chat room tonight so if you fancy joining me, do pop along. It's on the Food Network and starts at 9PM. The first one to scream HOUSE wins a can of Cheez Whiz. Check this website out by the way for all things Fieri related, it's brilliant. There should also be a category for when he sticks his fat hand in peoples food to preemptively eat things!